Doctors won’t be celebrating Independence Day on July 4th — at least when it comes to their professional practices. The days of the cottage industry physician are dwindling as more doctors are losing their independence, instead opting for employment. There are several reasons for physicians’ exodus from private practice: these include increasing administrative burdens, economies of scale for adopting information and communications technology, security in uncertain futures around reimbursement, and that all-important work-life balance. Accenturepoints out these trends in a summary report, Clinical Transformation: Dramatic Changes as Physician Employment Grows. Accenture sees benefits accruing to health systems acquiring physician practices, most notably the ability to “lock in” patient referrals and admissions for valuable service lines like cancer, cardiovascular, orthopaedics, and radiology. 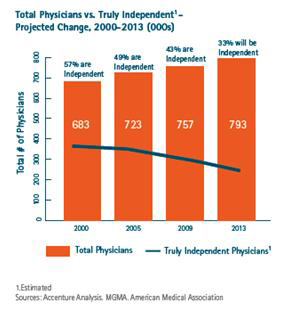 Health Populi’s Hot Points: The chart illustrates the precipitous decline in independent physician practices versus the proportion of all physicians. In 2009, 57% of U.S. physicians were independent. In 2013, Accenture forecasts that1 in 3 U.S. physicians will operate “truly” independently among the 793,000 physicians that will be practicing. As hospitals snap up physician practices, though, they’re altering the health ecosystem served by suppliers such as IT vendors, pharmaceutical companies, and medical device marketers. These organizations will need to examine their marketing and sales force tactics that hone in on local/regional differences in buying their goods and services. Influencers and key decision makers for purchasing, say EHRs and MRI systems will vary depending on the organizational model that physicians work in. This story points out that the health ecosystem is a complex organism of interrelated stakeholders. A dramatic shift in one stakeholder group — such as a huge decline in the number of independently operating physicians — will ripple through the health community in myriad ways: to suppliers that sell goods and services to doctors; to other providers, competing in the local marketplace; to health plans who negotiate with providers for payments in the regions in which they cover enrollees; and most overlooked, to patients, who will be accessing health services from larger, more consolidated groups. Will these larger groups provide more accessible, personalized health services to people? Or will the physician’s “bedside” or ”exam room” manner be compromised in a more corporate practice environment. There is no reason to believe the outcome will be one or the other, definitively. On one hand, the aggregation of more physicians in a group will enable that group to access information systems and technologies that could enhance the physician’s ability to provide a more engaging service by freeing up time for more care and less administrative tasks. If this is an objective for the health systems that are acquiring physicians, then it’s a noble one. If the sole objective is to gain volume to grow the topline in lucrative medical specialties, than the local communities — and health citizens — will lose. The check-and-balance here will be physician report carding, patient surveys (such as Press-Ganey), and paying-for-outcomes/performance.